KUALA LUMPUR - Like mother, like daughter. 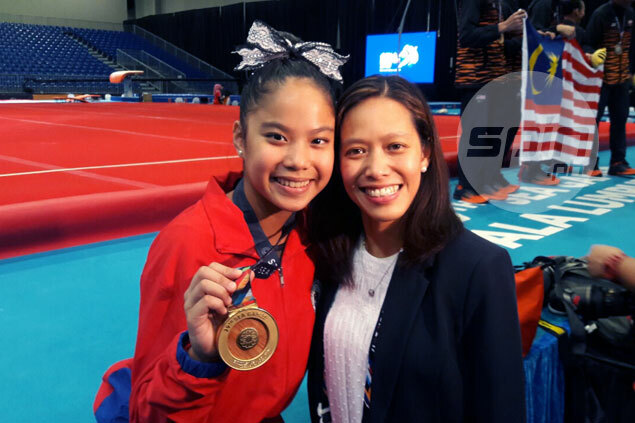 It was that kind of moment for Kaitlin De Guzman, who won the gold medal in the uneven bars in artistic gymnastics in the 2017 Southeast Asian Games - 22 years after her mother did it in 1995. De Guzman is the daughter of Cintamoni Dela Cruz, who in 1995 also ruled the uneven bars in Chang Mai, Thailand. Naturally, Dela Cruz is one proud mother. "Really proud. Really amazing. Tuwang tuwa kami," said 41-year-old Dela Cruz, now De Guzman. Dela Cruz said her daughter has been into gymnastics since she was five years old when she enrolled at the Milo summer program in Club Gymnastica. From that time on, Dela Cruz saw the potential in her daughter. "Yes. It is in the genes," said Dela Cruz, who is now based in Texas. The 17-year-old De Guzman is happy to see her hardwork pay off, having trained for a month together with the national team in Japan and in the Philippines. De Guzman is also in a home school program in the United States so that she can focus on her gymnastics career. This early, the Gymnastics Association of the Philippines has big plans for De Guzman. "Sinabi na nila na they want to be in the Asian Games and in the World Championships next year. Hopefully. We will see," said Dela Cruz.